Ok so my last attempt at keeping a regular blog didn’t go quite to plan seeing as my last entry appears to be from the 31st of October. What can I say, studying abroad really does keep you busy! But now that the festive season is well and truly over and the kiddies are back at school whilst my final year friends are slaving away in preparation for their dreaded January exams, I thought it might be time to reignite my blog in time for my departure to Spain this Thursday. 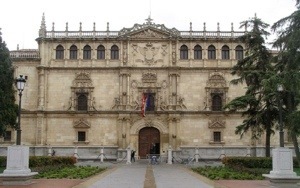 So in just 2 and a half days I’ll be setting off on my second European adventure, this time to a little city near to Madrid named Alcalá de Henares, of which I know very little so far, other than that it is the hometown of Cervantes. Pretty cool, huh (for all the others learning Spanish)? So last September before I arrived in France I had most things organised. A place to live, an idea of what I needed to do on arrival and at least a vague knowledge of the documents I needed to bring with me. Now of course I assume that the requirements is Spain will be reflective of those I needed in France but it is worrying nonetheless that the Spanish university I am attending has given no information or even a confirmation of having received my original application. Ordinarily I would worry, but I know I’m not alone and many people have comforted me, ‘it’s just the Spanish way’…well hopefully . Most worrying of all of course Is my lack of home. I joined the Erasmus Facebook page for the Universidad de Alcalá where everyone advises finding an apartment in the Center and thankfully there are numerous websites to help with this. And plenty of seemingly free apartments. The hard part? Getting any sort of reply from any landlord… it’s just the Spanish way……I’m putting further delays down to the festive season but really I can’t be sure. So I’ve booked a hostel for a few nights and will be extending that for as long as it takes to find somewhere…it’s not ideal but I’ll hopefully have more luck on arrival. I hope eeeek! Another thing to worry about Is the fact I haven’t really practiced any Spanish since my exams in May back in Edinburgh…apart from three weeks spent sunbathing on the costa del sol over summer (that doesn’t really count though does it…). Because of that, I’ve decided to do the intensive language course offered by the university. There was a little bit of confusion over whether or not it would be taking place so I can only hope that once I arrive that it does indeed go ahead otherwise I shall be stranded in a part of Spain I don’t know with no friends! Fingers crossed for me now please! And so now, to cut this a bit short, I think I ought to go sort myself out before I go…need to top up on my Spanish, print out multiple copies of my passport and start packing my currently empty suitcase(s).